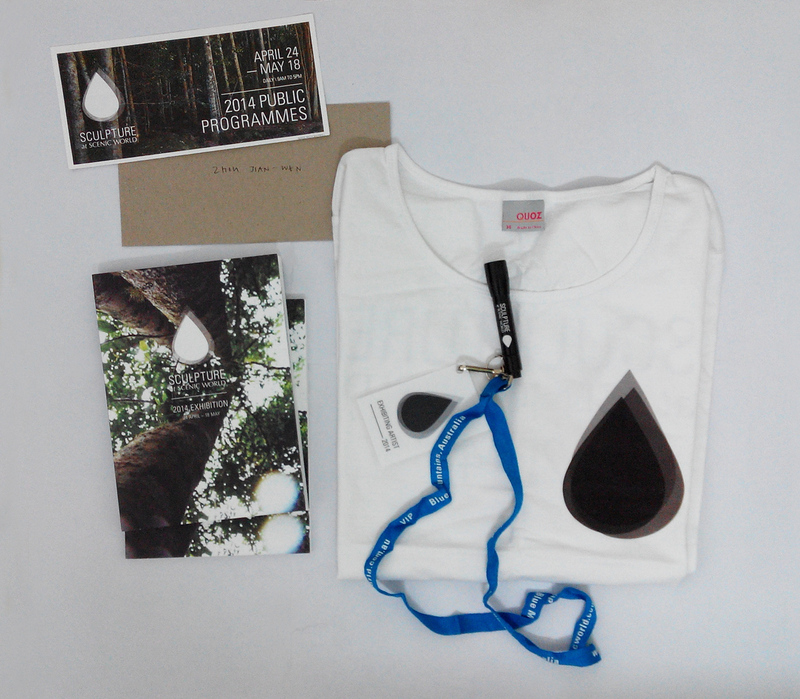 Sculpture at Scenic World 2014 Exhibitor pack: Catalogue, T-shirt, Vip card and Letter. Welcome to the third year of Sculpture at Scenic World. Each year exhibiting artists continue to surprise and inspire us with their vision, collectively transforming our rainforest into a stunning outdoor gallery for visitors to enjoy. It is wonderful to see several artists return to exhibit for their third consecutive year, alongside local and international artists interpreting our rainforest for the first time. We hope you take the opportunity to participate in one of our many public programmes, providing you with fascinating insight into the world of the artist, their passions and processes. We are excited to launch Sculpture Projects in 2014, with our inaugural project being a very special commission from iconic Australian artist, Ken Unsworth AM. Ken was invited to create a work in response to our environment and we are thrilled to see the work in situ – an eight metre high Harlequin’s Shuttle – and looking right at home in our ancient rainforest. Scenic World continually strives to create unforgettable experiences for our visitors and we are delighted by what has been achieved through this collaboration between Scenic World and the arts community. We invite you to take your time to enjoy both the artworks and rainforest as we feel it is this very combination that makes Sculpture at Scenic World so special. Sculpture at Scenic World, as our many visitors would know, is a unique exhibition. It is quite unlike other outdoor exhibitions. Our 2012 inaugural exhibition made a valuable contribution to not only the cultural landscape of Scenic World but the entirety of the Blue Mountains within this context. Our 2013 exhibition proved that definitions of site-specific works and site-responsive art need to be addressed. That context should not be the end result for any installation within our rainforest. Further to this, the exhibition is developing so that site and context are meshed with our reading and understanding of beautiful contributions artists have made for 2014. What will arise I hope through the artists’ sculptures will be an understanding of the works without the necessity to engage with medium nor particularly with a discussion of materials. Within this exhibition context the rainforest is the ubiquitous medium and the artworks are contemporaneous to the era of post-media art. Perhaps we should address the concerns of the artists’ works rather than their conduit of message. My understanding of these works come from lengthy conversations with the artists over the six months of them preparing their work from submission proposal to installation. My curation of them also informs these brief insights. Themes remarkably arise from this mixed bag of talents which is delivered via our independent judging panel who make the selection for exhibition of which I take no part. One particular theme which is of great interest to me as a curator are the works that manipulate the viewer physically. It is a brave stance by artists who rely on their audience to complete their works through physical engagement. It is also the most intuitive way to gain an active participation by audiences and to have a lasting resonance. The joy of the art is not passive looking but a physical completion, however subtly this is done. The exhibition is curated so that each work has its own unique room. As Richard Goodwin put it during the selection for exhibition process “most artists are looking for empty rooms; here, yours are already full”. This is beguilingly true, as the lush rainforest provides the perfect arena for a new vision of architectural installations. I had naively thought that this would be a key inspiration for artists during the inaugural exhibition. However, it has taken three years for there to be a collective architectural reaction by many of the 2014 artists. These works consider not so much the context of the rainforest but the space afforded to them, where intersections of form, colour and light become the essence of their installations. Thematically, communication and narrative provided the thesis for many works. Narrative is expressed via the episodic (moments frozen in time) and through utilising items of collective memory. It would also be uncharacteristic to have a contemporary outdoor exhibition without artists making political statements. Those artists who have been inspired by sociopolitical debates have erred from the didactic and the obvious. They also have not sacrificed their aesthetics. Interestingly many of these environmental statements were communicated through mutated organic forms. If these readings seem unlikely or questionable to viewers then perhaps the simplest pleasure is to see those sculptures as rare gifts, additions to the rainforest – in perhaps a newfound confidence in making that which has been long derided within outdoor exhibitions and indeed public art: ”plonk art”. Certainly, there are some sculptures which are here simply because of the beauty of form: no explanation necessary really. The Sculpture at Scenic World exhibition is one of a growing number of outdoor, public art annual events, filling the spectrum of the cultural calendar. Game artists exhibit alongside each other within this iconic location in a tussle for the notoriety and prize money, a big ask whilst also competing with nature. As if it isn’t hard enough to make and exhibit sculpture, these fellow artists take on the deepest and most luxurious rainforest in the mountains. The usual strategies treat this landscape as a series of green rooms, in which they tinker at the edges of the site-specificity creating a sense of special enclosure, to suggest a “green cube” in parallel to the eternal “white cube”. With this in mind I always remain skeptical of the results, forced by the circumstances into an abundance of compromises. For this reason I remain convinced that the landscape always wins for one side of the coin. On the other, however, we have the possibility of success. Why? Because the rainforest, which tumbles down cliffs to the valley below in the Blue Mountains, is a journey through dense and changing shadows and light. One snatches views and positions on the way, via a “Guggenheim” – like ramp on steroids. That ramp always attracted criticism and especially in its challenge to the horizontal, but it has sustained. Within Sculpture at Scenic World, the air itself has physical form, filled as it is with leaves, roots, vines and fecundity. It is a continual nest in which to lay eggs, to think metaphorically, and in which to accept flux. One either fights the camouflage effect or is happy to be hidden, only venturing into the consciousness of the most ardent of wanderers. Hence, it becomes logical that the strongest position, within this environment, is perhaps the most humble one. Humble, like a newly hatched brown chick, but powerful enough, as a strategy, to reflect on a millennia of evolution, while trying to survive. The art world also has heritage and strength. Bringing as I have done, these prejudices to the process of judging, I find myself encouraged by the range and purpose of proposals to date. 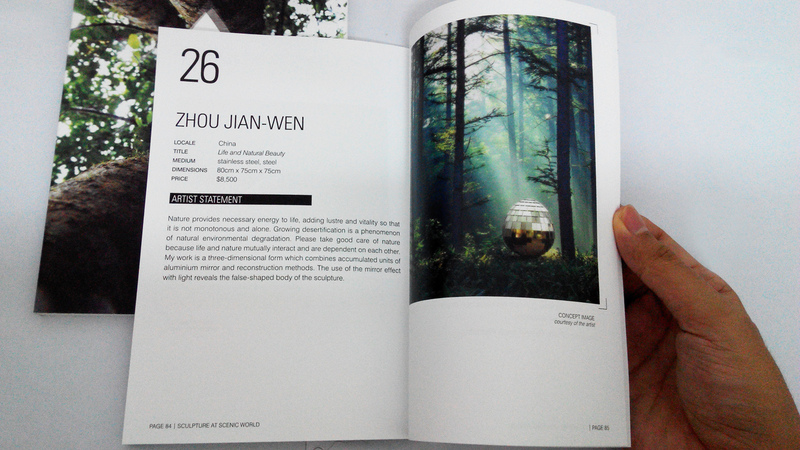 A few of these brave artists take on the rainforest with new and alien forms, which threaten existing typologies. Angus Adameitis’ Host is one such luridly painted steel form. With confidence and a rare ability Adameitis defies evolution with abstraction, daring stumps and vines to do better. This strategy also stretches to idealised forms such as international exhibitor Zhou Jian-wen’s stainless steel egg Life and Natural Beauty, ripe with potential for perfection. This work echoes Jayanto Damanik’s stainless steel reflecting egg Waiting. Elsewhere there is a yearning to assimilate gestures and learn from context. Trees and vines penetrate every space around the winding ribbon path, standing like basket-weavers bases for future envelopes of space. At their beckoning comes a large group of new-age weavers: from Ana Carter’s Dream Catchers, to Culkin + Geyer’s weaving between trees Uh-Uh! A Forest! A Big Dark Forest, and Deborah Redwood’s Sailing, a high tech interlacing, whilst Bronwyn Berman’s Hive II is a poetic use of traditional techniques. Collectively these works suggest shelter for the subconscious, these reactive threads are a response to the call for a haven which can transcend. Elianna Apostolides and DoGsWooD, bring a more predictive solution to large-scale site-specific weavings with a new set of metaphors. DoGsWooD’s wire and wood circuitry speaks to the parallel complexity of high technology and the workings of an eco-system, which depends on the sun in Network Breakdown, -wire making complex connections to an unplugged system. Whilst Apostolides weaves her Rhythm Shape I, II, III, riffing on roots but in idyllic stasis. The hairlike obsession with roots becomes a reflection of water flow within Henryk Topolnicki’s reclaimed aluminium Dead in the water. The simple introduction of the familiar art material of paint, by Marcus Tatton, titled Habitation, creates alien sticks showing us a way out or in. Again a humble strategy trumps this shady environment of green. As if to contradict the use of colour is a more formal answer to nature’s complexity. Morgan Shimeld’s Parallax Traced White attempts to abstract the irreducible catastrophe of nature. Seeking similar results is a work in glass by Kayo Yokoyama. Within 5th element she comments on the use of uranium creating mutated organic forms. Similarly Adam James K’s Strangling the Generation of Tomorrow introduces newly mutated habitants. Simon Alexander Cooks’ Terms of Trade (exchange) uses recycled industrial pipes like the Bower Bird’s collective joke on rubbish. Mimicry follows as another form of language in the giant leaf of Ted Nattle’s Leaves: Life in Death and the prehistoric knuckle bone of Paul Begg’s Dichotomy I. Compellingly Linda Galbraith’s Weary Journey, with a suitcase made in wax and resin, suggests historic samples discovered by a 19th century botanist now lost. The parasitic forms of transformation of the host body have always interested me as an artist/architect. How can something become something else, and how we can give new life fascinate me. So I was pleased to find this strategy being used by Tobias Richardson to transform a walkway storm shelter with a parasitic construction to give new meaning. Formal concerns are found in Kirsten Pieterse’s Ascendancy and Sandra Pitkin’s beautiful copper skeletons Within, mimicking palm bases and cellular structures. It is however through humour, figuration and illusion that I see fresh potential. These archaic strategies successfully compete with the density of this location. Maybe it’s their “fellow traveller” status that acknowledges the descent into darkness. Louis Pratt’s unlikely A Backwards Attitude, a figure in resin bent to defy gravity, dances or is danced by the landscape. Equally powerful are the sinister and surreal “bunny” characters of Todd Fuller’s Midnight Meeting. Alone and hilarious, but also deep in its reflection, is Roger Foley-Fogg’s (aka Ellis D Fogg) Stones Circle Chilling, Raving and Recovering, is an ode to Ken Unsworth, who is also immortalised in this exhibition. Poetically it will light when triggered by human action under the dark canopy, a one person rave to a million trees. Illusion leads us to the hauntingly reflective surface bound infinitely by the eternal depths of darkness within Please keep hands in the vehicle at all times by Daniel Kojta. Its amour in stainless steel will disappear only to be noticed as a type of mirage in the undergrowth. Hobart Hughes has created a water lens which reflects on the process of photosynthesis. Further to this, Photosympathise allows a magnification of specifics to its site and allows viewers to engage not only the minutae of nature but the man-made miniature sculpture by the artist. Achieved through the filtered light at specific locations on the glass bowl lens, this artwork maps its specific location through the power source of nature. Rude and funny is Tree line-a diminishing landscape as it transforms young tree saplings via the clamping on to their trunks of cast “clothes line” winders by Kay Andanopoulos. Small but effective parasites are Jacqueline Spedding’s ceramic pots hanging from the trees found in Transcend, which show remnants of the organic now open to growing moss accompanied by the haunting music of David Sudmalis’ Three Phases of the Dark Moon, which is an effecting soundscape with its infrasonic tones. Converse to Jacqueline Spedding’s hanging pots detailing through absence is her second artwork in this exhibition which is the oversized moth lying on the valley floor reminding us of our final journey into the depths of darkness with Vestiges of the Forgotten. But this is all speculation, fed by the projected ideas of the artists. I await reality and its challenges to my prejudices. There are not many opportunities in Australia for artists to respond directly to a natural environment. This gathering of Sculpture at Scenic World in the Blue Mountains is one of them. The challenge for artists working in nature is often the power of that very environment. We have a long tradition of public art from Egyptian tombs, to Greek statuary to Modernist welded sculpture. The context of the artwork is most commonly the constructed within our constructed world. The challenge for the artists working outside the constructed environment is how to make a human contribution to an environment, which is often over-powering in its natural attributes. A project like Sculpture at Scenic World 2014 provides the artists involved with unique challenges. Scenic World exists because of the particular natural environment in which it’s located. It is surrounded by World Heritage-listed landscapes for a very good reason. It is also, by its very nature, a significant location to all the people that have come in contact with it over the millennia. The challenge for contemporary artists placing work within this environment is a fundamental question. That is, how does an artist contribute to the environment in which they are asked to work? There are a number of fundamental approaches: these could be a sympathetic (or direct response) with the environment; a contrast with the environment; or ignore the existence of the environment altogether. In 1997 Chinese contemporary artist Zhuang Huan placed approximately 40 people in a Beijing fishpond within his performance work To Raise the Water Level in a Fishpond. The work was about immigration symbolized by raising the level of the water. In Chinese philosophy water is life. Raising the level of the water by adding people questions the impact of change and in this case questions the movement of people and their impact on a new environment. In this instance the artist has imposed humanity into a natural environment to talk about a very human condition. He could just as easily have been talking about people out of their comfort zone or people united by a common environment instead he is talking about a topical socio-political condition of internal migration in China. The artist’s vision is governed by the myth that he can apply to that particular environment a social condition unrelated to a current environmental issue of China. In contrast, Robert Smithson’s Spiral Jetty (1970), imposes an obviously human intervention into a landscape that wants us to reconsider what we understand about “place”. The third way of looking at this conundrum is Florentijn Hofman of the Netherlands through his inflated Rubber Duck series. This piece has been installed in many places around the world, with variable dimensions according to location, and it is about invented memory. In some way or another we are all meant to relate this Rubber Duck to our own experience of the popular bath toy even if we only know about them as a secondary collective memory. The Scenic World rainforest offers a complex relationship of natural environment and many histories of intervention, which have had an impact on its particular landscape. This area has been home to indigenous people for thousands of years; it has been a source of fuel for early white settlers and it has been a site of white expansion in Australia. As a result this location may be viewed as a point of cultural clash and cultural sensitivities that are currently trying to find some of level of co-existence. The complexity of local land histories provides enormous scope for artistic expression. The power of “place” provides a daunting prospect for an artist wishing to place expression within such a potent landscape. At the same time the physical grandeur and the cultural complexity of the site begs for interpretation of our relationships to the space that we occupy, and how that understanding can be a signifier of human change within varying cultural and personal interpretations. The artists you will see at Sculpture at Scenic World bestride the broad spectrum of artistic approaches to this environment. They may confront many issues. They present art in an overwhelming site, static art in a digital world, impact over content and the need to simply engage. The visitor/viewer of these artworks brings a personal experience to the expression of the artists’ work. Questions arise: is the artwork relevant to site? Could the artwork exist away from this site? Does the artwork contribute to the site? As we engage with these artworks we need to question what do the artworks add to the experience of the Blue Mountains? What effect does the artwork have on the impact of the location? What does the artwork add or subtract to the environment they occupy? We can ask it human intervention in the natural world adds to our experience or not? Does human intervention in the natural world create a greater venue than our manufactured world to consider our condition? The excitement of exhibitions such as Sculpture at Scenic World 2014 is that the success or otherwise of the art is only tested by the experience and the challenges it may bring. The concept of engaging art is not determined by categorization of medium or method of realization It is determined by the attitude, experiences, passion and perception provided by the artists, There is a common saying: “We build the road, and the road builds us”, hence, we make art and the art makes us. When one looks back throughout the 20th century’s development, it is hard not to notice that above the subject of political, economic and cultural development, the human existence in the environment has changed greatly. These issues will become the most serious and urgent tasks for the 21st century, as we are not only to question the current condition and what once was, but also, to know it is more important to invent new values that are within current limits and conditions.